Check out all new real estate projects in Emaar Beachfront at Dubai Harbour with their latest images, payment plans and prices. Introducing Sunset at Creek Beach by Emaar Properties at Dubai Creek Harbour, a new venture featuring family-friendly 1, 2, 3 and 4 Bedroom Apartments at Creek Beach, Dubai Creek Harbour. This project is all set to offer residential units, incorporating elements that appears to be a perfect mix of contemporary and cosmopolitan. Discover the best of both urban and beach experiences in the most coveted locale of Dubai, Dubai Creek Harbour. Stretching along the glimmering canal that runs between the island and mainland, Creek Beach is conceived to afford you the ultimate family-friendly retreat. From 300 metres of pristine white sands, to infinity pool, to spectacular sunset views, this is paradise reborn. Designed to nourish the soul, the Creek Beach district is a pedestrian-friendly sanctuary nestled between Creek Island Dubai and Dubai Creek Tower. Enjoy life in this prominent location that seamlessly blends the best waterfront experience with mainland convenience and connectivity. Poised to become the next covetable address in Jumeirah, Port de La Mer by Meraas is the embodiment of the ultimate resort living experience. Ideally located within a world-class marina, this exclusive seaside community is set to give you your own personal paradise with its exceptional collection of residences. La Cote, the first residential project at Port de La Mer, will provide an impressive selection of 1-4 bedroom apartments. Residential units will feature ultra-stylish interiors complemented by gorgeous views of the ocean and Dubai's iconic skyline. Creek Beach at Dubai Creek Harbour brings the ultimate convenience of an urban address within a spectacular beachfront setting. Nestled within the island and canals of Dubai Creek Harbour, the newest residential community by Emaar offers family-friendly seaside estates with elegant and functional living spaces, all equipped with smart home technology. Outdoors, a host of exciting experiences await with private access to 75 metres of pristine beach, scenic vistas and a spectacular selection of shopping, dining and leisure attractions. Sunrise Bay is a newly launched residential development at Emaar Beachfront by Emaar, the leading real estate developers based in Dubai, laying on the land of Dubai Harbour. Sunrise Bay comprises a premium twin towers of 26-storeys overlooking the Arabian Gulf , Palm Jumeirah, Dubai Marina, and Bluewaters Island, and just few steps away from the sparkling bay and a vibrant marina, and offers 1, 2, 3 and 4 bedroom apartments for sale in Dubai. Sunrise Bay towers are crafted genuinely in a contemporary approach mixed with welcoming colors and tranquil lines filling the exteriors and interiors as well. Architecture is inspired by modern yachting and maritime culture and adorned artfully with white sand and crystal water. EMAAR launched an exclusive waterfront apartments in an off-plan project called (Beach Vista). It offers luxurious 1, 2, 3, and 4-bedroom apartments for sale in Dubai with unparalleled specifications and features. 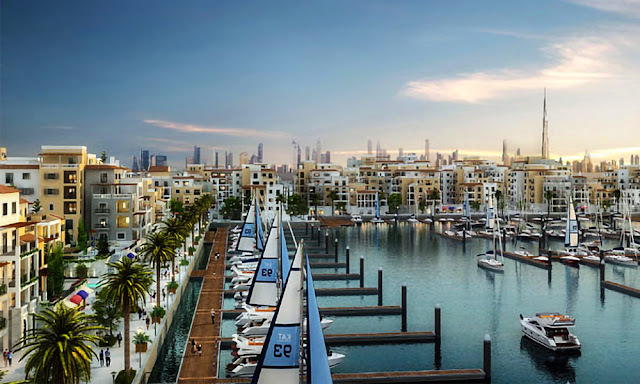 It will offer its residents a unique waterfront lifestyle combining the cosmopolitan essence of the city with the purity of azure waters of Arabian Gulf. 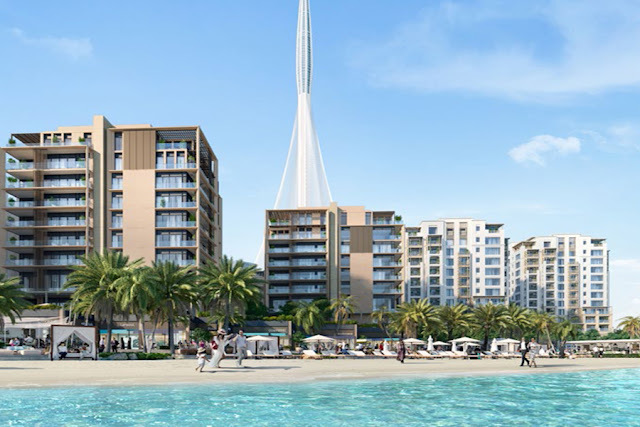 Beach Vista is the first project to be launched at EMAAR Beachfront, a cutting-edge apartment building comprising two stately towers connected by a podium level with a swimming pool. Emaar Beachfront is the exclusive residential community presented by EMAAR, the leading real estate developmer in Dubai, located within the new maritime landmark of the UAE, Dubai Harbour. A master-planned beachfront development represents a unique combination of urban living in a superb location and a serene waterfront lifestyle, creating an essence that you can find no where else but in Dubai. Emaar Beachfront will include upscale towers and buildings offering a wide range of 1, 2, 3 and 4-bedroom luxury apartments in the total of 27 towers. Regardless of the unit location, it will have a breathtaking vistas, whether the azure waters of the Arabian Gulf or the high-rise charming towers of Dubai Marina. His Highness Shaikh Mohammad Bin Rashid Al Maktoum, Vice-President and Prime Minister of the UAE and Ruler of Dubai, unveiled a new waterfront destination, a major new residential, leisure, retail, and entertainment development in Dubai, featuring the Middle East’s largest marina capable of handling 1,400 vessels is to be built on the western Dubai waterfront, opposing Palm Jumeriah, Dubai Marina, and Jumeirah Beach Residences (JBR). The 20 million square foot Dubai Harbour project will be developed by Meraas Holding and will contain a 135 metre high tower situated at the entrance of Dubai Harbour, Dubai Lighthouse, that will include a luxury hotel and an 360 degrees observation deck. It will also feature a 150,000 square feet cruise liner terminal capable of handling 6,000 passengers.